Young adults (YA) are at high-risk for unhealthy dietary behaviors and weight gain. 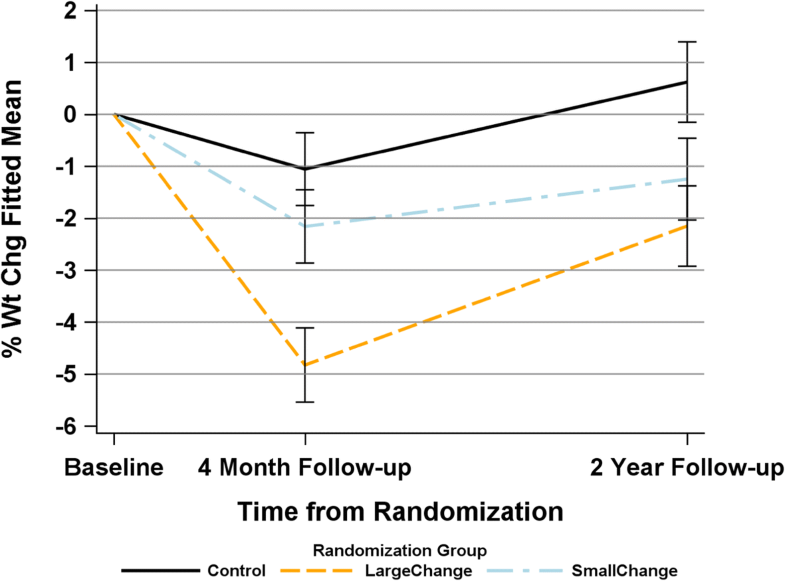 The Study of Novel Approaches to Weight Gain Prevention (SNAP) Trial demonstrated that two self-regulation approaches were effective in reducing weight gain over 2 years compared with control. The goal of this analysis was to examine effects of intervention on dietary outcomes and the association of diet changes with weight change. Participants were 599 YA, age 18–35 years, BMI 21.0–30.0 kg/m2 (27.4 ± 4.4 years; 25.4 ± 2.6 kg/m2; 22% men; 73% non-Hispanic White), who were recruited in Providence, RI and Chapel Hill, NC and randomized to self-regulation with Small Changes (SC), self-regulation with Large Changes (LC) or Control (C). SC and LC emphasized frequent self-weighing to cue behavior changes (small daily changes vs. periodic large changes) and targeted high-risk dietary behaviors. Diet and weight were assessed at baseline, 4 months and 2 years. LC and SC had greater decreases in energy intake than C at 4 months but not 2 years. LC had the greatest changes in percent calories from fat at 4 months, but differences were attenuated at 2 years. No differences in diet quality were observed. Across conditions, increased total energy consumption, fast food, meals away from home, and binge drinking, and decreased dietary quality and breakfast consumption were all associated with weight gain at 2 years. This study suggests the need to strengthen interventions to produce longer term changes in dietary intake and helps to identify specific behaviors associated with weight gain over time in young adults. Clinicaltrials.gov #NCT01183689, registered August 18, 2010. Young adulthood is a transitional period marked by significant risk for weight gain. In fact, data indicate that these years are associated with the highest rates of weight gain relative to other periods in the developmental life course and that weight gained during these years is associated with increased cardiometabolic risks later in life [1–3]. Furthermore, recent findings suggest weight gained between early and middle adulthood might also be associated with increased morbidity and mortality . Thus, effective weight gain prevention in this population is of paramount importance . There are myriad factors that contribute to the weight gain observed during these years, and young adulthood has been identified as a particularly high-risk period for unhealthy dietary behaviors. For example, evidence suggests that eating away from home and fast food consumption are very common in young adulthood, with more than 40% of total energy intake being consumed away from home and more frequent fast food intake associated with weight gain [6, 7]. Further, extant findings demonstrate that the transition into young adulthood is marked by increased sugared beverage consumption , alcohol and binge drinking , and decreased breakfast consumption , all of which can contribute to weight gain during these years. In addition to their association with weight gain, diet quality and eating related behaviors might further compound future health risks for already vulnerable young adults, given evidence linking diet quality to risk for some cancers, as well as cardiovascular disease [10, 11]. Despite mounting evidence signaling that young adulthood represents a critical time for intervention to promote healthful eating habits and prevent weight gain, relatively few studies have targeted young adults for weight gain prevention and the majority have failed to achieve positive outcomes over long-term follow-up [12–16]. The Study of Novel Approaches to Weight Gain Prevention (SNAP) Trial demonstrated that self-regulation interventions encouraging daily self-weighing, comparison of weight to a target, and corrective action can prevent weight gain in young adults over an average of 3 years of follow up . Details on the trial design  have been published previously, but in brief, participants were randomly assigned to one of three conditions: Self-regulation with Large Changes (LC), Self-regulation with Small Changes (SC), or Self-Guided Control (C). Both active interventions directly targeted high-risk dietary behaviors and patterns common in young adulthood but did so within the context of distinct approaches. LC promoted substantial changes to calorie and fat intake to produce a weight loss buffer during the initial 8 weeks of the program, whereas the SC condition promoted small, discrete dietary changes and participants were encouraged to continue making these small changes daily forever. At 2-years, both LC and SC demonstrated efficacy for preventing weight gain relative to Control but did not differ from one another . Whether LC and SC were associated with differential changes in dietary intake or eating behaviors remains unknown. To that end, the goal of this paper was to examine changes in key dietary outcomes within the SNAP Trial and explore whether improvements in these dietary behaviors were associated with more favorable weight trajectories over 2 years of follow-up. Specifically, the aims of this paper were to: 1) determine whether the 3 groups (LC, SC, Control) differed in changes in reported total energy intake, percent of calories from fat, or diet quality as measured by the Healthy Eating Index (HEI-2010); 2) determine whether there were group differences on changes on key dietary behaviors and eating patterns (e.g., meals away from home, fast food, breakfast consumption, alcohol intake); and 3) examine the relation between change in key dietary behaviors and weight change. Based on the intervention goals and targets, we hypothesized that the LC approach would produce greater reductions in total energy and fat intake during the initial 4-month intervention. Further, we hypothesized that at 2 years, both intervention groups would have lower total energy intake and fat intake, and better diet quality, compared with Control. A total of 599 participants were enrolled in the SNAP Trial. Eligible participants were women and men 18–35 years of age with a body mass index (BMI) of 21–30 kg/m2. Participants were excluded if they had major medical comorbidities that made unsupervised exercise or weight loss medically unsafe, if they had lost >10lbs recently, or if they were pregnant or planned to become pregnant during the initial intervention. Participants had to have internet access and be English speaking. Participants were recruited across two clinical sites (Providence, RI and Chapel Hill, NC) using a multi-method strategy and a variety of channels. See previously published reports for more details on the trial inclusion criteria [16, 17] and recruitment methods . Recruitment of participants occurred from 2010 to 2012 and data collection for the 2-year visit (end point for this paper) was completed in 2014. Eligible participants were randomly assigned within strata using 1:1:1 ratio to one of the intervention conditions using a variable block length randomization scheme that was programmed centrally using a secure password protected website app. Eligible participants were randomized to one of three conditions: Self-regulation with Large Changes (LC), Self-regulation with Small Changes (SC), or Control (C). Descriptions of the interventions have been published previously , but are briefly described here and summarized in Table 1. LC and SC participants received 10 group sessions (weekly weeks 1–8; monthly weeks 9–16). Group sessions were facilitated by masters level interventionists with backgrounds in nutrition, exercise physiology or psychology, all of whom had training and previous experience delivering behavioral weight management treatment within the context of a research protocol. Two interventionists co-facilitated each group session. Both interventions were grounded in a self-regulation framework [19, 20] wherein participants were taught to self-weigh daily and use the scale as an error detector to adjust behaviors as needed to meet their weight control goals. After the initial 4 months, participants were instructed to continue self-weighing and report their weight via a study website, text message or email. They received monthly email feedback on weight, which was linked to a color zone system and either reinforced their success, encouraged problem solving, or encouraged additional weight control strategies to reverse observed weight gains. In addition, participants were offered optional Internet-delivered 4-week refresher campaigns twice per year to reinforce concepts taught in their assigned condition. Participants in LC were encouraged to create a weight loss buffer of 5-10lbs during the initial program through calorie and fat goals (1200–1800 kcals, 30% calories from fat) and an increase in moderate-to-vigorous physical activity (250 min /week). If LC participants’ weight exceeded their baseline weight at any point during follow-up, they were advised to return to their calorie goal to reverse these gains. Participants assigned to SC were taught to make daily small changes to diet equal to approximately 100 kcals per day (e.g., swap a soda for a no-calorie drink or water), and to increase physical activity by adding 2000 steps per day over their baseline level. If SC participants experienced weight gains over baseline, they were taught to make additional small changes each day to reverse these gains. Participants in the Control arm attended one in-person group session, where they received general information on weight gain in young adults and an overview of both the Small and Large Changes approaches as well as publicly available websites where additional information could be obtained on each approach; they were encouraged to choose the approach that was best suited to their personal goals. All participants received quarterly newsletters throughout the trial, as well as personalized feedback on all assessment measures after each assessment visit. Weight and height were assessed at baseline, 4 months and 2 years by trained research staff masked to treatment assignment. Weight was measured following a 12-h fast in light street clothes and without shoes, on a calibrated scale. Height was measured using a wall-mounted stadiometer using standard procedures. Two measures of each were obtained and the average was used. Body mass index (BMI) is calculated as follows: weight in kilograms divided by height in meters squared. Dietary intake was assessed using the 2005 Block Food Frequency Questionnaire (Block FFQ) at baseline, 4 months and 2 years. This validated, quantitative 110-food item questionnaire  is designed to assess relative intake of energy, macro- and micronutrients, and food groups. For each food item on the FFQ, participants reported the frequency with which they consumed that item as well as usual portion size over the last month. Given the intervention targets, the primary variables of interest included: change in total energy intake (kcals) and change in percent calories from fat. The Block FFQ was developed using dietary data from a nationally representative sample of the U.S. population  and was selected for this trial because it allowed the young adult participants to complete the assessment online at their own convenience. The Block FFQ has been used in numerous previous weight loss intervention trials, including the Diabetes Prevention Program . Diet quality was measured using the Health Eating Index, 2010, which measures adherence to the Dietary Guidelines for Americans, 2010, the prevailing national dietary recommendations during the period of intervention [24, 25]. The HEI-2010 total score (out of 100) was determined using data obtained from the Block FFQ. Whereas diet quality was not a primary target of the interventions, several targets overlapped with national dietary recommendations (e.g. intake of fruits, vegetables, alcohol, added sugars). Estimation of ounces of diet and sugar-sweetened beverages in the past 30 days were calculated from separate questionnaire items for usual number of ounces and frequency of behavior. The first categorical question concerned frequency: “In the past 30 days, how did you consume sugar-sweetened beverages?” with responses of “none or less than one per week” converted to 0, “once per week” converted to 1, “twice per week” converted to 1, “3-4 times per week” converted to 3.5, “5–6 times per week” converted to 5.6, and “everyday” converted to 7. The second question concerned amount: “On the days that you consumed sugar-sweetened beverages over the last 30 days, how much did you drink” responses of “1 can” converted to 12 oz, “1 20-oz bottle” converted to 20, “2 cans” converted to 24 oz, “Big Gulp or 3 cans” converted to 36 oz. The answers to these two items were multiplied to estimate ounces consumed over 30 days. Parallel items and process were used for diet beverages. Alcohol intake was reported as number of drinks and the estimates were derived using data from two separate questions: “During the past 30, how many days did you have at least one drink of alcohol?” and “During past 30 days, on days you drank, how many alcoholic drinks did you drink on the average?”. Participants were also asked to report the frequency of fast food consumption, breakfast consumption and other meals away from home. These behaviors were considered important to examine given previous findings linking each of these behaviors to weight gain and / or diet quality in young adults specifically, and were drawn from the common elements items used in the EARLY Trials Consortium (https://earlytrials.org) . Differences among groups in baseline dietary quality and dietary behaviors were assessed using chi-squared tests for categorical variables and analysis of variance for continuous measures. In the case of continuous dietary quality and behavior measures, medians and interquartile ranges were also examined using non-parametric Wilcoxon Rank Sum tests to determine sensitivity to asymmetric distributions. Changes in intake and diet quality among groups from baseline to month 4 and year 2 were compared using separate regression models adjusted for baseline values. Windsorized methods were used for values above 99th percentile and below 1st percentile for change in eating frequency per day, estimated ounces of sugar sweetened beverages, diet beverages, and alcoholic beverages. Comparisons among the three groups were adjusted for multiple comparisons according to Scheffé’s method. Across all groups, relationships between weight change from baseline to month 4 or year 2 and change in dietary measures were assessed in separate models adjusting for baseline weight and respective baseline dietary measure. Partial correlations adjusted for baseline dietary measure, baseline weight, and group assignment were used to evaluate the association between dietary measure and weight change across all participants (or collapsed across the three groups). Stepwise variable selection models were employed to identify dietary measures with the strongest independent relationships with weight loss at month 4 and year 2, using p < 0.15 as the inclusion and exclusion criteria for variable selection; p < .05 was upheld in determining overall significance. Participants were 78% female, 73% non-Hispanic White, and averaged 27.7 ± 4.4 years. At baseline, participants had a BMI of 25.4 ± 2.6 kg/m2 and the majority worked full time (58%), whereas smaller subsets both worked and were in school (21%) or were full time students only (15.6%). Relationship status was relatively evenly distributed across married (31.6%), single (31.1%), and in a relationship (33.1%), with a small number of participants living with a significant other (4.3%). The majority of participants (67%) reported an annual income of < $49,000. Baseline dietary intake behaviors are described in Table 2; the three groups did not differ significantly at baseline on any of the dietary variables. Weight change at 4-months and 2 years is depicted in Fig. 1. At 4-months, both intervention arms were significantly different from one another (LC vs. SC, p < .001) and LC was also significantly different from Control (p < .0001), whereas SC was not significantly different from Control (p = .13). At 2 years as previously reported  both SC and LC were significantly different from Control (p = .02 and p < .001, respectively) but not from one another (p = .33). All dietary outcomes by intervention assignment are depicted in Table 3. Changes in total energy intake differed among the three groups at 4 months, with both intervention groups reporting greater decreases in total energy than Control. At 2-year follow-up, there were no significant differences in energy intake among groups. Changes in percent calories from fat also differed among groups; at both time points LC reported greater changes in dietary fat intake than SC or C, but the differences although still significant overall were attenuated at 2 years. Although there were improvements in overall dietary quality as measured by the HEI-2010, these differences did not significantly differ among the three conditions. Additionally, at 4 months both LC and SC reported significantly greater consumption of diet beverages compared to C, but no differences persisted at 2 years. Outcomes are displayed in Table 4. At both 4-months and 2 years, increases in total energy, percent calories from fat (month 4 only), fast food consumption, meals away from home, sugared beverage consumption (month 4 only), diet beverage consumption, and binge drinking were all associated with weight gain. Further, decreases in dietary quality were significantly associated with weight gain at 4 months and 2-year follow-up. Decreased frequency of breakfast consumption was associated with weight gain at the 2-year follow-up (see Table 4). To determine which of these variables had the strongest independent associations with weight changes over time, stepwise variable selection procedures were employed. These revealed that at 4-months, change in percent of calories from fat (p < .0001) and binge drinking (p = .004) were the strongest independent predictors of weight change. At year 2, change in binge drinking (p = .048) was the only predictor that was selected, while total calories (p = .07) and breakfast consumption (p = .059) approached significance. SNAP is one of the few randomized controlled trials to report positive findings for long-term weight gain prevention in young adults . The present findings further demonstrate that the interventions were associated with modest changes in dietary intake. Both LC and SC had greater decreases in total caloric intake relative to Control at 4 months. Although pairwise comparisons for changes in total energy intake were not statistically significant at 2 years, it is worth noting that both LC and SC experienced long-term reductions in the expected direction. This is consistent with our previous findings that both LC and SC were more effective in preventing weight gain at 2 years than Control, but were not significantly different from one another . Further, long-term changes in dietary fat appear to favor LC, which is consistent with fat gram goals prescribed in this condition during the initial intervention. If sustained over time, it is plausible that these reductions in fat could be associated with longer-term weight outcomes, but further follow-up is needed to determine this. Interestingly, data suggest that all groups improved diet quality modestly from baseline to month 4 and year 2 and that these changes did not differ by group. This small magnitude of changes in diet quality may be due to the fact that diet quality was relatively high in this sample at baseline. Specifically, HEI-2010 total scores averaged 67.7 out of 100 in this sample, as compared to 45.4 in a nationally representative sample of young adults . Not only was diet quality quite discrepant from previous reports of young adults, but the observed baseline mean is comparable to the 95th percentile for American adults, which may reflect some self-selection bias with those who enrolled in a weight gain prevention trial being more cognizant of diet quality than the average American. Both interventions targeted key high-risk eating behaviors that have been associated with weight gain in young adulthood – for example, decreasing fast food consumption and liquid calories, including sugared drinks (soda, coffee, energy drinks) as well as alcohol. Relative to Control, both LC and SC were associated with increases in diet beverages at 4 months, which is consistent with the core intervention materials. However, this effect was not sustained at 2 years. Further, while small improvements in other eating behaviors were observed, there were largely no group differences. The lack of long-term intervention effects for diet observed in the SNAP trial is consistent with recent findings from the CHOICES weight gain prevention trial  in community college students wherein some changes in eating behaviors were observed after the initial intervention relative to Control, but fast food consumption was the only dietary outcome for which effects were sustained over 2-year follow-up . Given the weight differences observed in SNAP between intervention and control, it is somewhat surprising that long-term changes in these high-risk eating behaviors were not observed. This could be in part due to lower levels at baseline; as noted above, diet quality was higher than would be anticipated for a sample of young adults, and baseline fast food and sugared beverage consumption were lower than national averages, which could reflect a more health conscious sample that is not reflective of the behaviors of young adults as a whole. Of note, the lack of group differences could also be due to assessment given that we didn’t use a more fine-grained assessment such as multiple pass 24-h recalls. Overall, increased total energy consumption, increased fast food, increased meals away from home, increased binge drinking, decreased dietary quality, and decreased breakfast consumption were associated with weight gain at 2 years. These findings are largely consistent with previous findings in cohort studies [6–9, 28] and speak to the importance of targeting these high-risk eating behaviors during these years. Of note, most intervention work targeting young adults has addressed all of these behaviors within the context of overall energy intake and more traditional weight management targets (i.e., calorie and fat goals) [29–31]. Future interventions might consider solely targeting discrete eating behaviors – for example, given the evidence linking meals away from home and fast food consumption with higher overall energy intake, poorer dietary quality, and increased risk for overweight / obesity , it would be of interest to determine whether targeting only these specific behaviors in the absence of a calorie goal would be sufficient to prevent weight gain and / or create an energy imbalance over time. However, given that stepwise variable selection procedures suggest that among these, binge drinking, total energy intake and breakfast had the strongest independent associations, targeting these other behaviors in the absence of overall energy goals could dampen the effects on weight control. Of note, the current findings signal that binge drinking might be an understudied dietary target linked to favorable weight trajectories over time. Given these findings and the high rates of binge eating during the transition into young adulthood , future work might consider developing integrated interventions to target both high-risk eating and high-risk drinking behaviors in this population. This study is not without limitations including self-report dietary data via FFQ, which assesses long-term, usual dietary intake using a structured food list with frequency responses section . It is possible that this tool was not sensitive enough to capture the differences in magnitude of total energy intake between groups over time. Although the online administration was an important pragmatic consideration with young adults, future trials targeting this age group might consider using the ASA-24 , which would provide a balance between rigor and practical considerations given the recalls are self-administered online. Similarly, our assessment methods likely lacked precision regarding change in key dietary variables of interest, such as quantity of sugared beverages consumed; dietary recalls would provide greater specificity for the assessment of these variables in future work. Further, because dietary intake was only assessed at baseline, 4 months and 2 years, it is unknown whether the interventions resulted in changes in diet that persisted beyond the initial intervention period, but not for a full two years. However, the attenuated and / or null results at 2 years underscore the need for continued intervention or perhaps bouts of more intensive intervention beyond what was offered in the refresher campaigns used in this trial. Finally, despite considerable targeted recruitment efforts across two clinical sites, our sample was predominantly non-Hispanic White and female, and thus, findings might not generalize to young adult men or racial / ethnic minority young adults. Major strengths of this work include a high-risk population of young adults and a weight gain prevention trial that tested two distinct dietary approaches. This provided an opportunity to examine change in dietary variables and whether they differ by intervention assignment to further inform the discussion as to which of the intervention approaches – Large Changes or Small Changes – should be recommended widely to promote health. Given that both appear effective in preventing weight gain  and there do not appear to be any significant long-term differential effects on the majority of dietary outcomes, future investigations might focus on identifying baseline characteristics that can be used to predict who might be more likely to benefit from the Large Changes vs. Small Changes approach – that is, what works for whom both in terms of weight gain prevention and dietary change. Longer-term follow-up for the SNAP Trial is underway, which will help to answer these questions. Additional strengths worth noting include outstanding retention over long-term follow-up, and a generalizable sample of young adults with respect to the distribution of age, work and school status, and two clinical sites in different geographic regions of the U.S. Findings from the present study help to identify specific dietary behaviors associated with weight gain over time in young adults. Further, data point to binge drinking as a potentially novel target for future weight control interventions. And finally, taken together, the lack of sustained intervention effects observed at 2 years underscores the need for more intensive intervention approaches to produce long-term changes in diet in this high-risk population. The Miriam Hospital/Brown Medical School Rena R. Wing, PhD1; Erica Ferguson, BS, RD2; Ana Almeida; Kristen Annis; Ryan Busha; Isabella Cassell; Eva Chen; Pamela Coward, MS, RD; Jose DaCruz; Caitlin Egan, MS; Michelle Fisher; Stephanie Guerra; Susan Himes; Brittany James; Marie Kearns; Angelica McHugh; Kevin O’Leary; Kathy Palmer; Deborah Ranslow-Robles; Amanda Samuels; Kathryn Story; Kelly Strohacker; Zeely Sylvia; Jennifer Trautvetter; Jessica Unick; Kristen Whitehead; Samantha Williams; Carolyn Wunsch; Annajane Yolken. The University of North Carolina at Chapel Hill Deborah Tate, PhD1; Karen E. Hatley, MPH, RD2; Candace Alick; Shelia Barnes; Loneke Blackman; Rachel Bordogna; Kimberly Cooper; Melissa Crane; Victoria Cryer; Molly Diamond; Jennifer Frank; Noel Kulik; Hannah Lerner; Megan McMullin; Kristen Polzien; Keneisha Quick; Brooke Tompkins; Brie Turner-McGrievey, PhD, MS, RD; Carmina Valle; Stephen Zablonski; Erin Zeigler. University of Alabama at Birmingham Cora E. Lewis, MD, MSPH3. University of Connecticut Amy Gorin, PhD3. Virginia Commonwealth University School of Medicine Jessica G. LaRose, PhD3. Wake Forest University School of Medicine Mark A. Espeland, PhD1; Letitia H. Perdue, MS2; Judy L. Bahnson, BA, CCRP3; Wei Lang, PhD3; Cheryl Bentley; Patty Davis, BS; Katelyn Garcia, MS; Leah P. Griffin, MS; Lea Harvin, BS; Mary A. Hontz, BA; Mark King, BS; Kathy Lane, BS; Rebecca H. Neiberg, MS; Julia Robertson, BS. Central Laboratory, Northwest Lipid Metabolism and Diabetes Research Laboratories Santica M. Marcovina, PhD, ScD1; Jessica Hurting2; Vinod Gaur, PhD. National Heart, Lung, and Blood Institute S. Sonia Arteaga, PhD; Catherine Loria, PhD, MS, FAHA. All other SNAP staff members are listed alphabetically by site. Funding for this study was provided by grant NHLBI U01HL090864 to RRW, DFT and MAE. The funding agency played no role in the analysis of the data or interpretation of the findings. The content of this article is solely the responsibility of the authors and does not necessarily represent the official views of NHLBI or the National Institutes of Health. The dataset used in the current study is not yet available but will be deposited in NHLBI BioLINCC. Inquiries prior to release should be addressed to the SNAP Principal Investigators (Wing, Tate, Espeland). RRW and DFT conceived of the study; RRW, DFT, MAE, AAG, JGL and CEL designed the study and acquired funding; LP, ER and KH coordinated the trial and were responsible for acquisition of the data; RHN analyzed the data; JGL, RHN and EWE interpreted the findings; JGL and RHN drafted the manuscript; all authors revised the manuscript for important intellectual content; all authors reviewed and approved of the submitted version of the manuscript. All procedures were reviewed at approved by the Wake Forest University IRB (Coordinating Center) and the Miriam Hospital IRB (Clinical Site) and University of North Carolina at Chapel Hill IRB (Clinical Site). All participants provided informed consent to participate in the study; consent forms were reviewed and approved by the IRBs at the Clinical Sites. DFT is on the Scientific Advisory Board for Weight Watchers International. No other conflicts to declare. United States Department of Health and Human Services. Substance Abuse and Mental Health Services Administration. Center for Behavioral Health Statistics and Quality. National Survey on Drug Use and Health, 2016. https://www.samhsa.gov/data/sites/default/files/NSDUH-DetTabs-2015/NSDUH-DetTabs-2015/NSDUH-DetTabs-2015.pdf. Accessed 15 May 2017. LaRose JG, Tate DF, Lanoye A, Fava JL, Jelalian E, Blumenthal M, Caccavale LJ, Wing RR. Adapting evidence-based behavioral weight loss programs for emerging adults: A pilot randomized controlled trial. J Health Psychol. 2017. epub ahead of print. https://doi.org/10.1177/1359105316688951.